I know, I know, I’m a day late. I have had a sick kid and now I’ve got a sick husband. Last night I crashed well before 11p which is a record for me as most nights I don’t go to bed until midnight or so. Life. It happens. I’ve got a really great stories for you to read today. Enjoy, show some support, and thanks for sharing the journey! This entry was posted in blogger and tagged blogosphere, Postpartum Mood Disorder on October 30, 2009 by LHale. This entry was posted in fathers, husbands, Paternal Postnatal Depression, public awareness and tagged depressed dad, divorce, fatherhood, Joel Schwartzberg, Paternal Postnatal Depression, Postpartum Dads Project on October 23, 2009 by LHale. Welcome to this week’s round-up of brave bloggers speaking up about their experience with Postpartum Mood Disorders. Let them know they’re not alone! Kristen at Dine & Dish serves up her experience along with a recipe for Chocolate cake. Cuz yanno – chocolate always everything better! Lisa over at The Nuthouse waxes on how the cycle of Postpartum Depression begins. Redmama over at Mooshinindy wrote an absolutely fabulous piece entitled “On being your mom with depression.” Tear jerker alert here. This week also brings us a brief post from a new dad who thinks he might qualify for struggling with Paternal Postnatal Depression. Chris @ You mean there are TWO??? shares briefly about men with postpartum depression and includes a few good resources for men struggling with this issue. This entry was posted in family, fathers, frazzled, infant, mom, postpartum depression and tagged blogger, new father, new mother, postpartum depression on October 22, 2009 by LHale. Today, rather than a guided topic, I’d like to open up today’s Just Talkin’ to the readers. Have something you need to vent about? Questions about Postpartum Mood Disorders? Something you wish you had known when you were recovering? A general comment? This entry was posted in advocate, blogger, Just Talkin Tuesday, Perinatal Mood Disorders, postpartum depression and tagged Just Talkin Tuesday, postpartum depression, Postpartum Mood Disorders on October 20, 2009 by LHale. 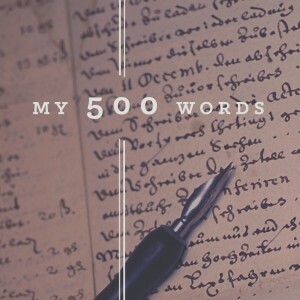 Over the past summer as I was working through writer’s block and a few other things, there was an essay that lept forth from my fingers. I’ve kept it tucked away. Why? It’s very graphic for one thing. It scares the crap out of me. And frankly I didn’t want to scare the crap out of you, my dear readers. But I realize that if I am to be honest about my experiences I have to be honest about ALL of my experiences. You simply can’t shove Postpartum Mood Disorders up in a neat little box and tie it off with a satin bow to sit daintily in the corner and wait. No, Postpartum Mood Disorders are more like the exploded laundry basket that is slowly overtaking your house. Regardless of how many times you empty it, it hops about, filling back up and leaving pieces of clothing all over the place. This is really more for me than anyone else. I realize that makes me selfish to a certain extent but I also know that being so brutally honest may just help someone down the road too. It’s time I stopped living with the fear of what others will think of me (yes, even I have fear – I’m human just like you) when I say or do something. It’s time I did just what I did with my Postpartum OCD. Stand. Turn. Fight. SO – because this piece is truly graphic and should NOT be read by those who are still struggling, I’ve placed it on a separate page. With a warning in bright red at the top. Be warned that there are also a couple of four letter words in there too. Like I said – it kind of spilled forth from my finger tips in a venting rage. I have not edited it much at all. You can get to it by clicking here. Feel free to comment either there or here or both. Or not at all. Thanks for reading. Thanks for listening. Sometimes that’s all a mom needs. This entry was posted in motherhood, postpartum depression, Postpartum Obsessive-Compulsive Disorder, public awareness, strong woman and tagged motherhood, postpartum depression, Postpartum Insanity, Postpartum OCD on October 18, 2009 by LHale. This particular story is entitled “Missing my darling daughter, 15.5 weeks postpartum.” This mother lost her daughter when she experienced complications during pregnancy and ended up delivering nearly 8 weeks early. Her story is a brave and important one, especially today. Click here to read the story. Please light a candle at 7:00 p.m. no matter your time zone in remembrance of those who have been lost during pregnancy or shortly thereafter. This entry was posted in postpartum depression and tagged National Pregnancy and Infant Loss Remembrance Day on October 15, 2009 by LHale. I’d like to recognize the growing numbers of bloggers discussing Postpartum Depression here at Sharing the Journey. I’ll try to post a list like this each week. If you come across (or write) a great blog that includes a postpartum mood disorder experience and isn’t already on my blog roll, email it to me @ ppdacceptance at gmail dot com. Sisters from different Misters (Cassie) shares about “Things I’ve learned from my therapist,” a relationship which all started when she developed postpartum depression. And while the next link is not a blog, it’s a worthy read. An article from Wales which delves into the postnatal depression experience and encourages mothers not to suffer alone. You can read this article by clicking here. This entry was posted in blogger, mom, motherhood, Perinatal Mood Disorders, Postpartum Anxiety, postpartum depression, strong woman, woman, women and tagged advocacy, bloggers, postpartum, sharing on October 15, 2009 by LHale. Earlier this evening through a search on Twitter for #postpartum, I found a tweet mentioning that Postpartum Depression Expert Mike Silverman would be appearing on Issues with Jane on the Headline News Channel. So of course, I retweeted it. I regret having done so. Issues with Jane is a sensationalist show. And the story was a horrific one out of Florida regarding a mother who was very very cruel to her children. Once the possibility of untreated Postpartum Depression was brought up, one of the panelists could be heard in the background saying “oh please.” The very fact that Postpartum Depression was dragged into this is horrible. They went on to discuss young girls having kids and not knowing how to raise them, how the educational system was failing them, etc. I have to say that I am very disappointed in this show. Instead of opening up about Postpartum Depression and educating, they further perpetuated the myth of sensational cases and behavior often involved in stigmatizing mothers who don’t feel so great/happy/fuzzy after the birth of a baby. Thanks, Jane. Thanks so much for being a sensitive and understanding fellow woman. Thanks Dr. Mike for dragging Postpartum into this. Thanks for perpetuating the stigma instead of removing it. Way to go, guys. This entry was posted in media sensationalism, postpartum depression and tagged Dr. Mike Silverman, Headline News, Issues with Jane, Jane Velez Mitchell on October 14, 2009 by LHale. 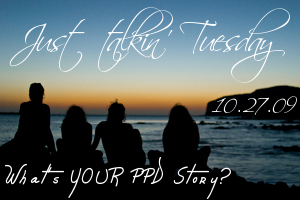 Just Talkin’ Tuesday 10.13.09: I’m OUT with my PPD – are you? Within the past couple of weeks I read a great article by a columnist down in Palm Beach, Florida. Of course the article is from February 2008 but still relevant. The author waxes over various reactions she’s received as a result of coming clean about her mental struggles and illness. But in the end she decides that shes would not change a thing about coming “out” about her struggles. I started this blog as a way to cope with my third and very unexpected pregnancy on the heels of a nasty episode of Postpartum OCD which landed me in a psych ward. While there, several of the nurses specifically told me I did not have to share with anyone where I had been or why I had been there. Even at the time I remember thinking that was an odd thing to say. Why would I want to hide what had happened to me? Why would I do such a thing when all I wanted was to talk with another mom who was struggling just like me? Wouldn’t it make sense to reach out to other moms? To open up? What good would hiding my “light under a bushel” do? Out. Shining. And still struggling from time to time. I have stages – right now I’m struggling a bit with not having the same bond with my girls as I do with my little guy. You see, I didn’t have PPD with him so we got to have the fun bonding way it’s supposed to be according to the books experience. Which, by the way, I found a little weird considering I had never done it that way before. But now I find myself saddened and angry that I never got to bond as strongly with the girls as I have with my little man. But alas, I digress. Let’s get to just talkin here! If you’ve “outed” your PPD whether it be through a blog, a book, a news story, sharing with a friend, loved one, co-worker, etc, tell us about the experience. Was it positive? Negative? What you expected? Has the experience of “outing” your PPD changed your life? For the better? For the worse? Let us know! This entry was posted in blogger, Perinatal Mood Disorders, public awareness and tagged advocate, author, blogger, mental illness, postpartum depression, stigma on October 13, 2009 by LHale.